This past solstice weekend, my friends and I drove four hours up island to tackle the tenth annual Kusam Klimb: a half marathon race up a 1,500m (4,800ft) mountain. This was my first experience with long distance adventure racing. In fact, before Saturday I had never run anything longer than a 10km. I am an hiker and backpacker and hoped that experience would be enough. Here is a photo of Mt. H’Kusam. No one was actually going to run the whole 23km, would they? Here is a photo of us right before the race starts, around 6:45am. I am in the purple fleece, in retrospect: totally unprepared for what was about to happen. I came wearing my hiking clothes and boots. Most people were wearing tights or shorts and brightly coloured runners. That’s ok, I thought. I am in no rush. I am just here for a big, organized hike. Then we and the other 460 people started crowding around the start line. There was a countdown and we were off! The first 2km are on the main road through Sayward. Everyone near us in the pack was running, so I ran too. There were a few spectators out cheering us on. I took it nice and slow though. I wasn’t totally excited to be running already, as I didn’t want to tire myself out before we even got started. I kept up the slow and steady jog to checkpoint one where they were giving out water and gatorade. The trail was definitely uphill but nothing too technical yet. We passed a woman telling her friend she couldn’t do it and wanted to go back down. Then it started getting steeper. There was a bit of a bottle neck near particularly steep sections. Our pace slowed down to a quick walk and we came to a complete stop at some points, as there was almost no way to pass. I was in a good mood, joking and talking with people around me. I was happy to finally be hiking up a mountain. People were definitely starting to feel the burn. Some people started to drop out of the pack and take a rest or have a snack. Lots of people were stretching or rubbing sore muscles. I’ve heard this part of the trail compared to the Grouse Grind outside of Vancouver, which is fairly accurate. Except there is no gondola ride down! Eventually it started to flatten out again, so I knew we were near at the top. The trail has a shorter peak, then a dip down to a lake, and then another quick climb up to the summit. I was stopping to take in this gorgeous scenery, when several people in running shoes came sprinting past me. One of the runners, seeing my shocked expression, yelled to us: Don’t worry, you can pass us again on the next uphill! This is when I realized I had not understood what I signed up for. Never before had I been on top of a mountain watching people run! So up we went again, on the other side of the saddle, seeing snow for the first time. Then we finally made it to the highest part of the trail: 1482 meters. The guy in blue reflective coat was a volunteer with the local search and rescue group. At this moment, I was feeling very grateful to the countless volunteers who got up at who knows what hour, standing around in the cold, to make sure we were all safe. Our group took about five minutes at the top to eat, pee and take a quick summit selfie. This quickly felt like way too long of a break. I started feeling very cold and most people were zipping past us without stopping. 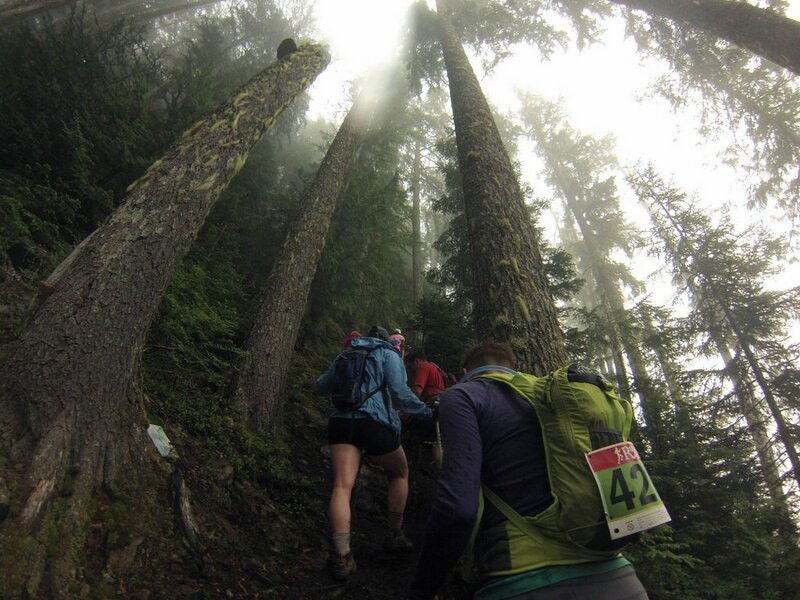 So off we went, for what I thought was the most fun part of the race: the steep decent. Most people were wearing gloves so that they could hold on to the ropes to stabilize themselves while running down the muddy, slippery slopes. Apparently there is usually much more snow than this. Some snowy parts did not have ropes, and people were sliding everywhere. I caught this guy midway through a big wipe out. He bent one of his poles in this fall and had to carry it poking out of his backpack the rest of the hike. In some parts, the snow was so compacted that the only safe way down was sliding on your behind. Very fast (and fun!) sliding. After we slid and slipped through 2.5 km of mud and snow, we reached another checkpoint. This time it marked a small river crossing on a narrow log. The snow was behind us, but many more (and wetter) river crossings were ahead. We got to the next checkpoint. It was around 11:00am. The volunteers were serving watermelon and Nanaimo bars. I asked my boyfriend optimistically if we were finished now. He said no. We were officially halfway. I had a sinking feeling in my gut. I kept going, but quickly realized the last part of the race was just going to be a very long, not very technical, downhill run. I was feeling hungry and tired. And not being a runner, I could not keep up with my friends. They kept going with my blessing. I started walk-jogging alone. With about 8km to go, my knee started hurting and it became extremely painful to bend it. I have a weak right knee from a previous injury. A few years ago, I re-injured it during a steep hike and ended up not being able to walk for 2 weeks. I really wanted to push past the pain and keep hustling, but I decided to start walking. I was still moving as quickly as I could though, as the race energy had caught up with me. This was no longer just an organized hike! It still was a hard, long and lonely final push. Thankfully, one of my friends, who had finished about an hour before me, came back up the trail looking for me. She kept me company as I limped through the final kilometer, supporting part of my weight on my hiking pole. I crossed the finish line at 5 hours and 45 minutes, which I was surprised to see was just under the average time. Someone saw me in my injured state and said: It looks like you have Kusam limp! I was just grateful to be able to sit down again. Here is our group at the end, much wetter, muddier and hungrier. When we got back to the cabin we rented, I soaked my aching legs in the freezing cold lake. This was photo taken by my friend Carrie. Thankfully my knee pain subsided with some rest, advil and about 3,000 calories of potluck dinner. Nothing hurts now except some very sore muscles. I think if I had kept running that last 8km, it would be a very different story. Would I do the Kusam Klimb again? Absolutely! But next time, I’m bringing some running shoes. Thanks for commenting! I am looking at your photos now, they are great. Loved your play by play! A group of us are coming up for the first time this year and you’ve given an idea of what we might encounter. Thanks much! Great pic’s! A great first account. Thank you for sharing. We look forward to seeing you again. Thank you! The go pro is a great little camera 🙂 Congrats on your personal best time! That’s so awesome!! 🙂 If you see a picture of you that you like, just let me know and I can send you the original. As soon as I saw that pic I thought it was you Marlene. Want to do it with me next year? This is wonderful! I was wondering what to expect and your photo-essay is fantastic. I’m registered for this year and plan to “walk” more than run the event – a goal of 5 hours was my intent, but this has made me re-assess that to maybe 7-8. I was debating between my hikers or some technical trail shoes and you have solved that question for me as well. Thank-you. Did you see many bears? If so, in the distance? or were they nearer? Did you take bear spray? Don’t worry, the bears will be scared away by all the people and noise. If you want to bring some safety equipment, I’d suggest a really loud whistle. You could use this to scare off any bears in the very unlikely scenario you see one, but also signal to people for help if you got lost. (Also very unlikely, as there are so many people out there and the trail is very clear.) And a whistle is much lighter than bear spray, which really matters. And don’t even bring bear spray when I’m hiking with small groups or alone. When I see bear, I just usually just back off and yell something silly like “Hey bear! You need to move cause my trail is right there!” and/or clap my hands. And they just scamper away. But usually I don’t even see them. I’ve walked right past a bear before and had someone right behind me tell me. So don’t fear the bears! They want nothing to do with us. I DO bring bear spray if I’m camping somewhere where people have not always been bear-aware & bears may have become unafraid of humans, like Sombrio Beach. But to my knowledge, Kusam is fine. Perfect, Jes, thanks so much .. so much to read and so many different hiker opinions, but of course yours is the only one that is experience with this Kusam Klimb. A week to go and we’re up doing it .. can’t wait! We did it!! 6 hrs 58 min .. thanks for your blog and all the great tips .. they sure helped us be prepared. Not a flake of snow, the lake was without any ice … bonus extra ropes this year on the steep downhills. Thank you for sharing your journey 💛 I’ve only been at the bottom of that mountain, never the top. I need to get in shape so that I too can attempt this climb 😜 Your photos are simply amazing and I love your sense of humour 😊 You should keep adventuring and keep writing ‼️Your story truly inspired me! Heading up this weekend…2017! Excited for the challenge ahead. Thank you for this great blog, as it sure helps to get a bit more prepared.